In my latest Verdict column, I discuss the decision by the US and various other countries to recognize Juan Guaidó as the legitimate president of Venezuela. I frame my discussion around the question whether, and if so why, it is appropriate for outside states to deny recognition to Nicolás Maduro on the ground that his election was tainted when such states continue to recognize authoritarian leaders of other countries (I name Saudi Arabia and North Korea) who have no democratic legitimacy. I offer two answers. First, I note that there are practical/prudential reasons why democratic regimes recognize undemocratic ones. Second, I argue that there is something particularly bad about subverting a democratic regime. To make that second point, however, I need to address the fact that some wholly undemocratic regimes have "sham constitutions" that purport to be democratic. While hardly approving of sham constitutionalism, I nonetheless acknowledge that in most cases (as in North Korea), it is easy enough to see that the constitution was never meant to be taken seriously. To illustrate the possibility that it could be worse--at least along one dimension--for a leader to subvert his country's genuine democratic norm than for a leader to rule autocratically without the serious pretense of democratic legitimacy, I draw on the concept of an "uncanny valley," familiar from the study of robotics. A robot that looks nothing like a human is not creepy. Neither is an actual human. But a robot who looks pretty close but not quite close enough to a human is creepy. It falls within the uncanny valley. I suggest an analogy for systems of government. Here I want to ask whether we can find other uncanny valleys. Depending on how loosely one defines the concept, my guess is that we can find a great many. As in my jump from feeling creeped out by humanoid robots to being especially concerned about undercutting democracy, both the independent and the dependent variable can be almost anything. The idea is that the x-axis measures how close something is to some ideal, while the y-axis is some normative measure. 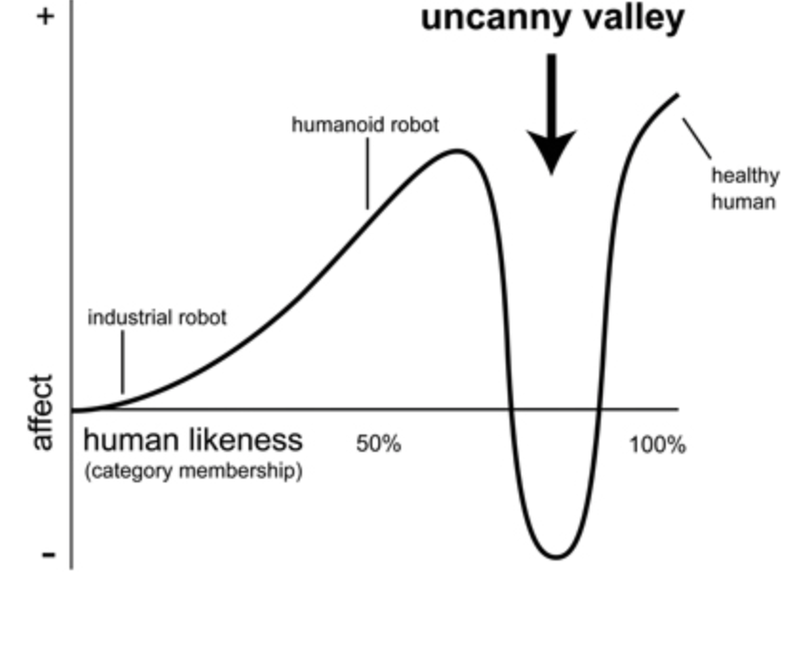 An uncanny valley occurs when approaching the ideal causes first a dip and then a rise in the y-value. 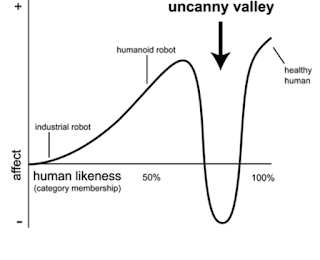 To the left is a graph for robots to human likeness, but as I'm using the uncanny valley concept, we could have other variables as well. (1) x-axis = team quality; y-axis = fan satisfaction. I'm a New York Knicks fan. For the last several years, the Knicks have been terrible. As a result, I don't expect them to win, so I rarely watch them. If they were to get a little better, my satisfaction as a fan would improve as they would occasionally surprise me by winning. If they were to get a lot better but not quite championship-caliber, my satisfaction would then decline, because I would have false hope that would be invariably frustrated. If they were to get a whole lot better to the point where they won some championships, my satisfaction would peak. Obviously, not everyone feels this way about teams they follow, but I'm guessing that enough fans do that for some substantial number, the relationship I've just described marks an uncanny valley. (3) x-axis = how close a job candidate comes to getting hired at a particular school the first time he or she applies to be a law professor there; y-axis = likelihood of being hired by that school. I occasionally advise former students who are seeking entry-level positions as law professors. The process has three main stages: (a) submitting written material via the Association of American Law Schools (AALS); (b) attending the AALS hiring conference at which prospective employer schools send hiring teams to conduct 1/2-hour screening interviews; (c) giving a "job talk" and attending office interviews on-campus. A candidate whose written material doesn't make the cut is eliminated at stage (a). One who successfully navigates all three stages receives a job offer. That's the right-hand peak of the curve. In between are candidates who get eliminated at stages (b) and (c). A candidate who does not end up with any satisfactory job offers will often try again in the following year. If so, that candidate will likely be rejected at stage (a) from any school at which she progressed to stage (b) or (c) in the prior year, but if she was rejected by a school at stage (a) in the prior year, she might make it all the way through to an offer from that school. Why? Because the school's hiring committee will likely have no recollection of a candidate rejected at stage (a) or is using different hiring criteria in the next year (looking for a torts teacher, say, after a retirement), but a candidate who came close but didn't get the cigar will be subject to a kind of res judicata. In other words, the curve will include an uncanny valley. To be sure, not all hiring works in this way. To give a famous example, President Clinton interviewed both then-Judge Ginsburg and then-Judge Breyer for his first Supreme Court appointment. He gave it to Ginsburg, reportedly because Breyer did not connect with Clinton during the interview. (If so, that may have been because Breyer was still recovering from a bicycling accident.) If the AALS uncanny valley curve applied to this kind of hiring, then Breyer should have been largely out of the running for Clinton's next appointment, but as we know, Clinton tapped Breyer. In many contexts, being runner up or coming close the first time around puts one in good stead for the next time around. Whether any particular graph exhibits an uncanny valley is ultimately an empirical question. I invite readers to propose other uncanny valleys. Note, however, that not every curve that goes up, then down, then up again includes an uncanny valley. There must be some way in which the close-but-no-cigar phenomenon contributes to the effect. For example, suppose we were to plot on the x-axis the time since an addict takes a drug and on the y-axis the addict's sense of physical well-being. Well-being would go up initially as the drug travels through the body. Then, as the drug wears off, well-being would go down. It would then plummet as the addict goes into withdrawal. Well-being would then go up as the now-former addict had kicked the habit. The curve would have the right overall shape, but that would not be a consequence of the close-but-no-cigar phenomenon. Maybe poisons work in that way as well. What makes carbon monoxide so poisonous is that it does what oxygen does (bonding to hemoglobin) but better and therefore makes it into the body preferentially, although I suppose this means that it is especially canny as far as the body is concerned. But maybe we resist uncanny valley so much out of an evolutionarily justified fear of anything that is trying to mimic something else. When it mimics successfully, of course, we don't know that it has. 1. You're totally right on sports. As an Atlantan, I'm actually less of a Falcons fan now than I was before the recent Super Bowl debacle. Creepy is a kind word to explain being up 28-3 late in the third quarter, only to blow it. But my Braves on the other hand, have me way excited - we overachieved last season after years of rebuilding. 2. This is a stretch, but I remember the late night TV wars back in the 90s. David Letterman was initially sickened by the idea of launching a CBS show; it would always fall short of the Tonight Show in his eyes. But once he changed the paradigm and thought of it as a different vehicle, one he could fully make his own without any kind of expectations (tradition, etc. ), he ran with it. 3. Yes on your music examples. I agree. That Hendrix tune is an all-time classic. As a Pink Floyd guy, most covers fall short to me, I think because imitators try too hard to approximate the original. 4. I wonder if the RINO / DINO dynamic smacks of this. After all, it can be both creepy and insulting when somebody from the other party tacks in your direction. I can't think of a bunch of covers off the top of my head, but the really obvious candidate for best cover ever is Aretha Franklin's cover of Otis Redding's "Respect." (1) The Aretha Franklin version is so iconic that I didn't even realize it was a cover. (2) I have another candidate: In some religions, apostasy is considered much worse than holding a completely different faith. Feelin Alright cover by Joe Cocker of the original by Traffic. (1) I was having a boomerish week and went so far as to listen to two Crosby Stills Nash (Young) songs, and their "Questions" is a colossal improvement on the recording Stills did of it with Buffalo Springfield. (2) In Judaism, converting to Christianity is generally more traumatizing for one's relatives than converting to something like Buddhism, though the former overlaps with Judaism much more, obviously, than the latter.